With seemingly endless venue options to choose from for your wedding ceremony and reception in Barbados, it's hard to narrow down your choices and select "the one." 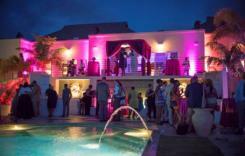 Barbados offers a range of idyllic locations for a special celebration. The stunning, tropical surroundings epitomizes most couples' idea of a dream wedding or honeymoon destination, framed by white sand beaches and clear blue waters. The natural simplicity of a tropical hideaway, combined with the luxuries of a modern beach residence, guarantee a blissful and memorable wedding experience.